If you haven’t noticed, we live in a time where the political trend is quite simple. Things that would never happen before, that were once thought to be downright “inconceivable,” are happening right now, and with stunning regularity. And it’s not fake news, it’s real. We’re seeing it in the U.S. and, of course, in the democracy built in its own image, the Philippines. Despite protests heard round the world and in the U.S., it finally happened. The late dictator Ferdinand Marcos, heavily preserved, unburied since 1989, finally got covered up with some hallowed dirt. Once they got a green light from the Supreme Court in the Philippines last week, Imelda Marcos and her family couldn’t wait to put the country’s democratic embarrassment into the ground as a hero. The “hero’s burial” for Marcos was another win for Philippine President Rodrigo Duterte, the Filipino Trump, who manages to do as he pleases, justice be damned. Duterte was spectacularly modest about his political achievement. This time, his wish was to honor his personal hero, a man who Amnesty International says imprisoned 70,000 people during martial law, tortured 34,000, and killed 3,240 Filipinos. Small numbers compared to Duterte’s current effort to fight “shabu,” the Asian form of crystal meth. The anti-drug effort by police has officially racked up 2,500 deaths. But Philippines media says the death toll is closer to a number that outdoes Marcos–4,000. And the number includes innocent civilians. Duterte talks tough and has years to to catch up with Marcos, who not only imprisoned, tortured, and killed his political opponents, but also plundered the country’s treasury and enriched his family by more than $10 billion. That’s more than double what Trump’s worth. 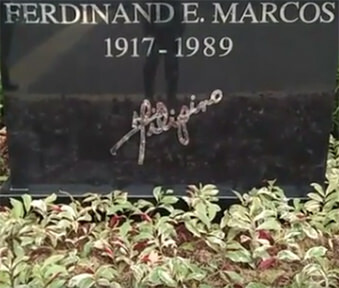 Marcos, propped up by the Reagan and Bush Administrations as he ruled the Philippines with an iron hand for nearly three decades, was laid to rest Thursday in the country’s national cemetery for heroes, the Libingan ng mga Bayani, in Manila. After being on display in his home province in northern Luzon, Marcos was quickly flown to Manila buried in an almost secret way. Sort of like the man being dubbed a hero. 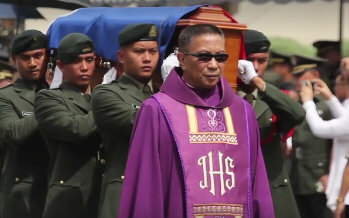 Even though political opponents were planning to file an appeal, the Marcos family and the Philippine Army were able to rush the body to burial. And then the Marcos posted scenes from the burial on social media. It was an insult to the thousands of protesters worldwide, including many of the four million Filipinos in America, nearly 20 percent of the Asian American population. Most of them came to the U.S. for just one reason—to escape the Marcos years. They didn’t want to be among the thousands who died or the millions repressed because of Marcos’ autocratic rule. Allowing the burial legitimizes the Marcos repressive dictatorship and sends a sad, dark message about Duterte to the Filipino people and the world. Democratic rule? Rule of law? Does it exist in Duterte’s world? Or did they bury all that too with Marcos? In this era of outsiders, anti-elites, nationalistic strongmen, and disruptive forces in world politics, the burial of the denounced dictator Marcos was just the latest inconceivable to occur. In May, the victory of Duterte, a local mayor with a strong law and order bent but little international experience, became a leading indicator for what was to follow. In June came the Brexit vote. And then here in the U.S. on Nov. 8, we had the election of the least qualified man ever to become president. Takes a bit of the edge off Duterte rehabbing the plunderer Marcos as a hero. But it’s still a bona fide inconceivable. As the editorial head of Breitbart, he’s taken shots at Muslims, women, trans people, as well as people of color and immigrants. And all with that glow of a happy flame-throwing white nationalist. If Ailes and Fox had moderated and become the mainstream, Breitbart under Bannon was the white ethnic media. Last year, when Bannon, the editor, interviewed Trump, the conversation turned to foreign students on H1-B visas returning home instead of taking jobs or starting companies in the U.S. Trump was cautious and wanted to keep talented people in the country. But not Bannon. “When two-thirds or three-quarters of the CEOs in Silicon valley are from South Asia or from Asia, I think…” Bannon didn’t finish his sentence, but implied his disapproval, typical of his Eurocentric, pro-white beliefs. Now he has the president’s ear, not as a “journalist,” but as a senior advisor. Inconceivable? At one time. Not anymore. And the hits keep on coming. Just this morning, Sen. Jeff Sessions (R-Alabama) accepted his nomination as the 84th attorney general of the nation. Besides that, Trump thinks he’s a swell guy. This is the man who will head the Department of Justice. My Lord, we will miss Loretta Lynch. Inconceivable just a few months ago. But it’s all part of something we’ve fought before. Now we are challenged to fight again the old ghosts revived in these new Trump times, just to keep from being buried alive.